The Beatles Song of the Day is For You Blue. For You Blue is on The Beatles Let It Be album- and was the b-side of The Long And Winding Road single. For You Blue was written by George Harrison. George wrote the song for his wife Pattie. George is said to have been influenced to write this after a visit to see Bob Dylan and The Band in Woodstock, New York in late 1968. George Harrison: vocal, acoustic guitar: Paul McCartney: piano: John Lennon: slide guitar: Ringo Starr: drums: Produced by Phil Spector. Rating For You Blue *** stars out of 5 stars. 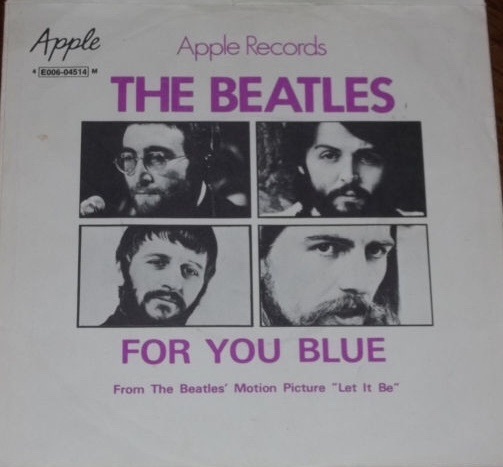 For You Blue was the b-side of the #1 hit- The Long And Winding Road single. Recorded on January 25, 1969.
critic Bill Wyman ranks For You Blue at #183 of 213 Beatles songs, it wasn’t ranked in any of the others Top 100. But Elmore James had nuthin’ on it! Feels like McCartney was the only one trying at this point.